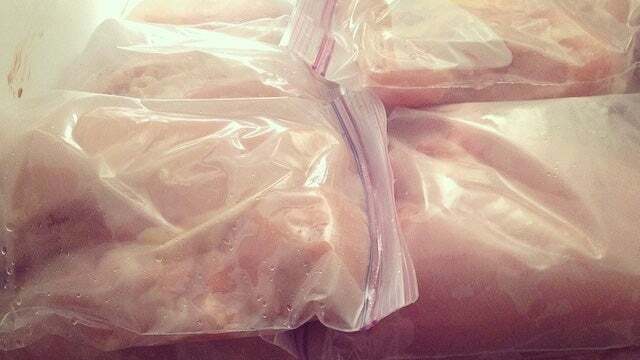 If you ever buy chicken and freeze some to use later, here's a simple trick that's better than brining for turning out juicier meat: Salt the chicken before you freeze it. Photo by taz + belly. Cook's Illustrated conducted an experiment comparing moisture loss before and after freezing. Without salting or brining, the chicken lost 22 per cent of its moisture when cooked. With brining before freezing, it lost 15 per cent of its moisture. The best method was salting before freezing, with a moisture loss of just 11% per cent. Treating the chicken before freezing works better than after because it gives the salt additional time to do its job — while the meat is freezing and then again while it is thawing. Salting the chicken before freezing works better than brining since salting creates a more concentrated brine at the surface of the meat, allowing more salt to travel into the meat. A higher concentration of salt within the meat allows it to hold onto more moisture (up to a point, at least; concentrations above a certain amount can actually have a negative effect). All you need to do is sprinkle your chicken with salt, leave it in the fridge for an hour, then pat dry, wrap and freeze. Good to know for the next time you buy chicken in bulk from Costco or cut up a chicken to freeze some parts for later.